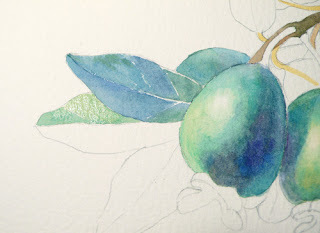 This post is a demonstration of painting a watercolor painting from start to finish. The subject of this demo is egg-shaped green fruits, called pineapple guava. The fruits' waxy skin turns blue-gray when the light hits the surface. In this demo, you will see how to use wet in wet and basic layering techniques. 1. The Plan: First, with watercolor, you always need to plan ahead. 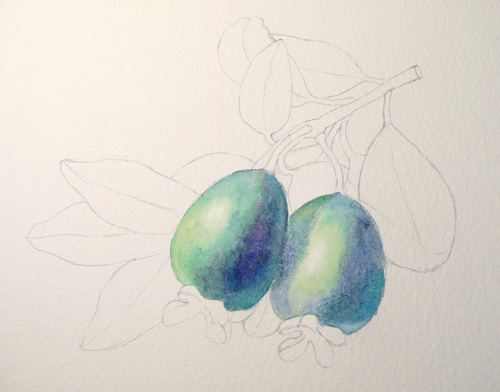 Because of the nature of watercolor, once you paint it on, there is no going back. So, it is always a good idea that you plan ahead, maybe do a little color sketch to figure out what you want to do. I plan I to leave the background white in this painting, so I decided that the objects at the foreground will be darker in value and more saturated in color than the objects closer to the background. The leaves at the back will be lighter in value and also muted in color to create depth in this setting. 2. 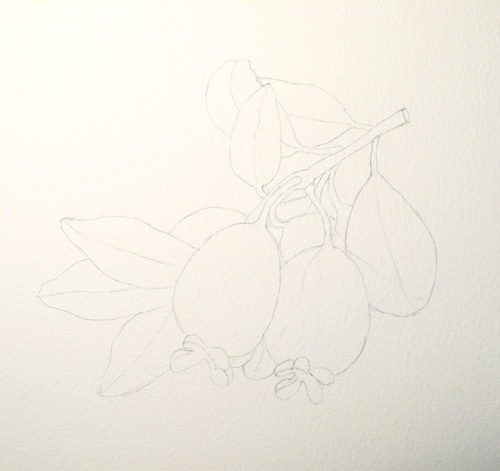 Sketch it out: Lightly draw the contour drawing. I sometimes mark down the cast shadow and high light area, so that later, I can see more clearly which area is which. a. Wet the area of one of the fruits with clean water. b. While the area is still wet, apply the first layer of color. 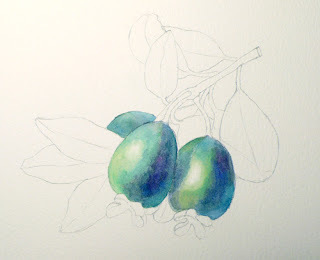 c. Again, while the area is still wet, apply second layer of darker color which is the form shadow of the fruit. 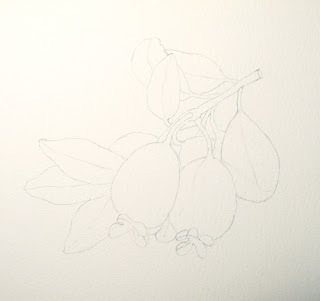 d. Repeat the steps 3a-3c for the other fruit and the cast shadow. e. I have decided to make the fruit at the far back lighter, so I just do a simple wash on it. 4. First layer of the branch: Mix some brunt umber and green to paint the first layer of the branch. Once you have painted the branch, we need to wait for it to dry to paint the second layer. Since we need to wait, I start working on the leaves next. 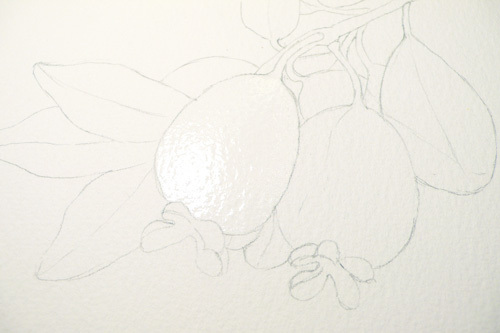 a. Painting one leaf at a time, leave thin white gaps to indicate the thickness and the texture of the leaf. It will look like patches of paint are connected together. b. Once you finish a leaf, move on to another leaf and make sure the surrounding area is dry. c. Apply second layer of paint using wet on dry to darken some of the leaves. You can see the leaf on the far right was not dark enough, so I added another layer of watercolor on it to make it darker and create some texture at the same time. 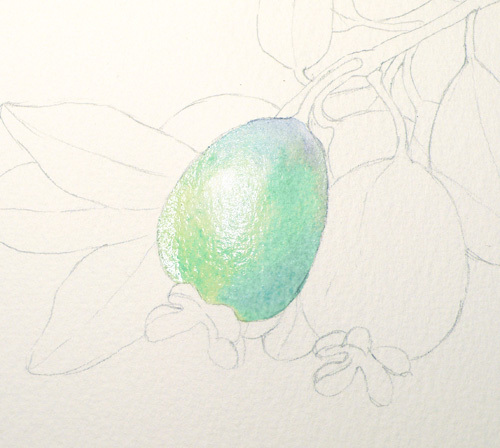 Bottom of the fruits: Start with a wash of yellow-green. After the first layer dries, use the wet on dry technique to apply the darker colors. 7. Detail touch-up: Now go back to do another layer of shadow on the branches and create te textures of knots. Using smaller brushes to achieve painting small detail area. Detail of the finished painting. The finished painting. 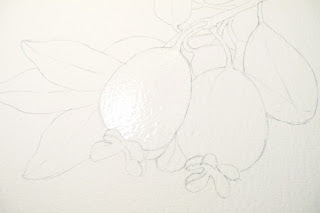 That is how you paint fruit using both the wet in wet and wet on dry techniques. Article and artwork by Hsuan-Chi Chen.